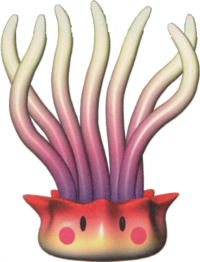 Sea Anemones are sea creatures with long, stinging tentacles that appear in Yoshi's Story. They are only found in the level "Lots O'Fish". Sea Anemones are invincible and cannot be defeated. They act as stationary obstacles, moving their tentacles back and forth in an attempt to snare prey. Some Sea Anemones have the ability to move their arms in and out. They normally guard Melons and Heart Coins, which Yoshi must snag with his tongue to avoid the tentacles. Isozukinchan From 「イソギンチャク」 isoginchaku (sea anemone) and chan. 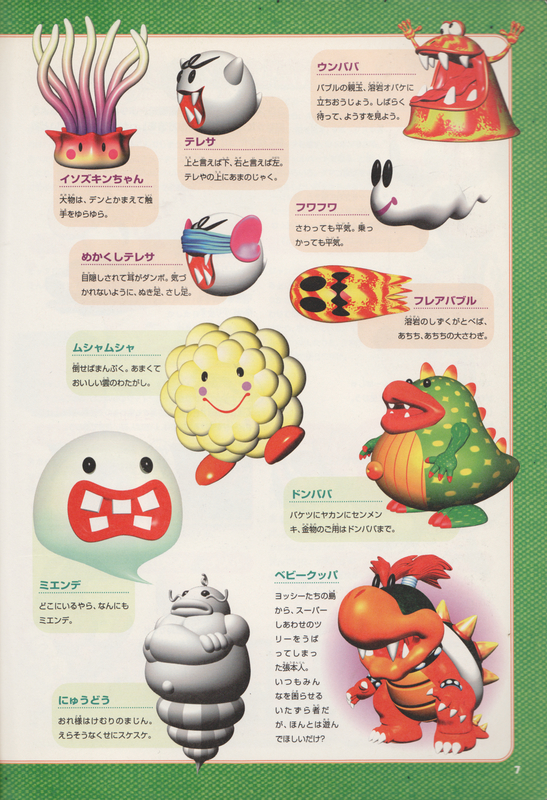 ↑ 「ヨッシーストーリー 任天堂公式ガイドブック」 (Yoshi's Story Nintendo Kōshiki Guidebook), page 7. This page was last edited on April 11, 2019, at 14:18.